Salvage Drum Definition Clarified by DOT - Drum It Up! Per CFR 173.3(c), Salvage Drums have long been used as overpacks for the efficient and effective transport of damaged, defective or leaking containers, irrespective of whether these packagings are discovered before or after having been placed in transportation. In 2005, the DOT expanded the Salvage Drum definition to include non-compliant packagings (contents in inappropriate packagings). The ultimate use of these overpacked drums is to proceed to the nearest appropriate disposal or repackaging facility. 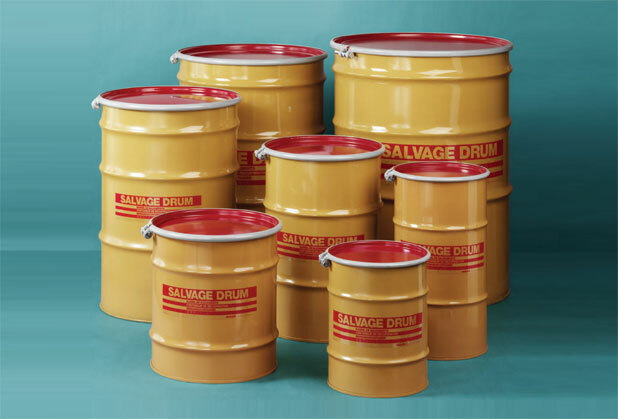 Salvage Drums are not to be used as a secondary container, or overpack, for a primary shipment. Recently, DOT commented that while it is their intent for these packagings to be used for damaged, defective, leaking or non-compliant packagings that have already entered transportation, it is also their intent to limit the use to when packagings are discovered to be non-conforming after having been placed in transportation. “Recently, DOT commented that while it is their intent for these packagings to be used for damaged, defective, leaking or non-compliant packagings that have already entered transportation, it is also their intent to limit the use to when packagings are discovered to be non-conforming after having been placed in transportation”. The DOT issued a Letter of Interpretation regarding the Salvage Drum requirements (Reference #08-0003) on May 6th, 2008. This is the link to that letter.